Acerola Cherry plant, Malpighia glabra, is also known as Barbados Cherry, West Indian Cherry and Tree of Life. Acerola Cherry is an attractive tree that is grown as much for ornamental purposes as for its sweet fruit. Cherry like fruit is extremely high in Vit. C. The fruit is red turning almost black when ripe and may be up to 5cm in diameter. Use fresh, juiced or in jam. Native of tropical America. 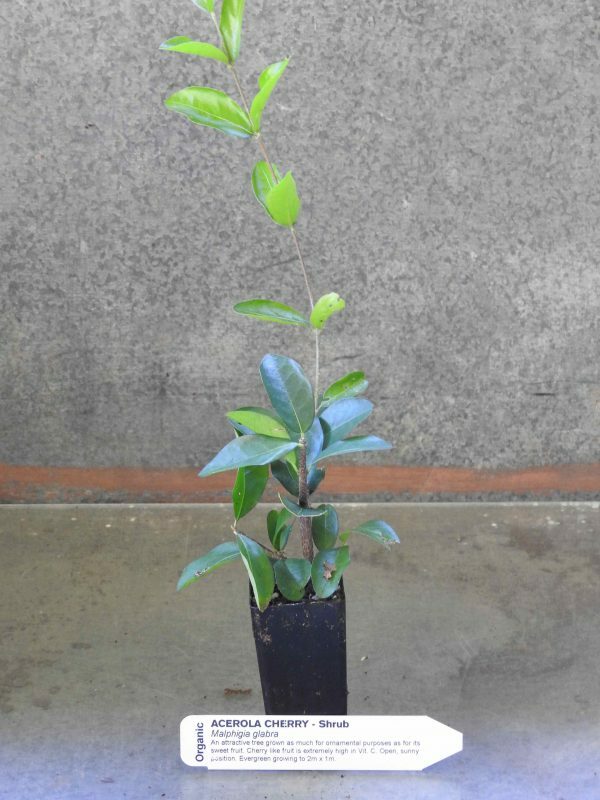 Acerola Cherry plant prefers rich, moist, well-drained soils in an open, sunny position. Drought and frost tender. It will tolerate a light frost. An evergreen shrub, growing to 2m x 1m. May be grown as a tub specimen.